MEN and women in blue often grace the pages of this paper, pictured at crime scenes or a courthouse in their official capacities. But at home, they are loved spouses, partners, parents, friends. Every day these emergency service workers put on their uniform and head to work, they are putting themselves at risk in order to keep the community safe. Before a quiet home in Granville became the centre of a siege in September last year, the first man on scene faced a potentially deadly situation. Senior Constable Stephen Veitch came face-to-face with a man believed to be armed with a shotgun. He followed all the right procedures and helped a woman and a child to safety. 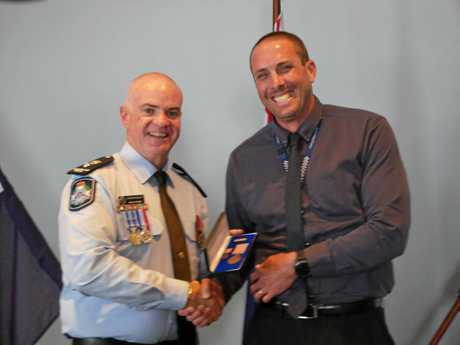 He was yesterday recognised at the Maryborough Patrol Group Medal presentation for his actions. The award presentation acknowledged officers for both their longevity in the service and special acts of bravery. 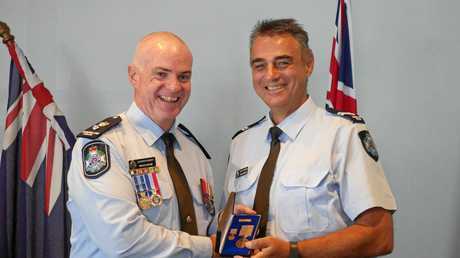 Sergeant Chris Mahon was recognised for the vital assistance he provided during Cyclone Debbie, working his heart out in a high-risk zone. 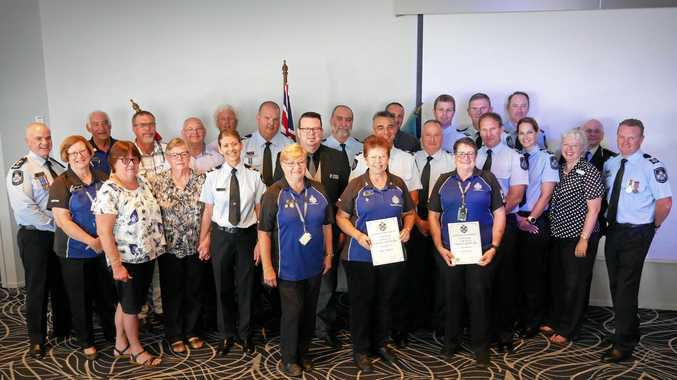 Former Senior Sergeant Danny Willett and former Sergeant Wayne Tincknell, both retired, were recognised for their service. Others were awarded for major milestones in their careers, including Sergeant Shane Coles and Sergeant Paul Reason, who were given their 35-year medals. Volunteers in Policing members were also given certificates. Friends and family of award recipients were there to watch their loved ones being honoured. SENIOR Constable Josh Gamosh has found a niche in policing which fulfils his love of technology. He specialises in electronic evidence, which includes preserving information from devices like iPhones and computers and downloading encrypted data from a hard drive. Working behind the scenes, he focuses on a range of crime cases from murder to assault and child exploitation. Snr Const Gamosh's role is one of many pathways in policing which aren't as visible but are just as vital. 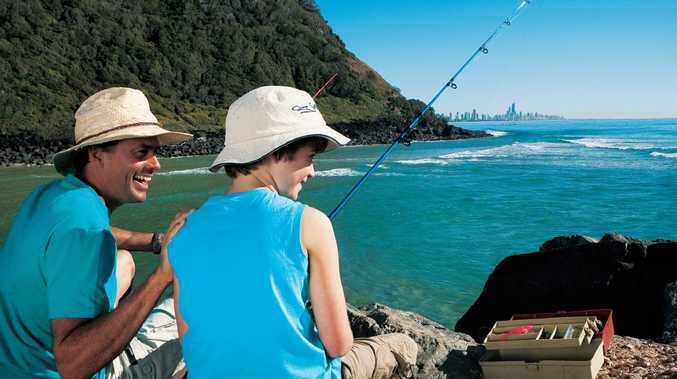 Officers can also switch from uniform to plain clothes roles as was the case for Senior Constable Chris O'Brien. Dressed in a dark-coloured shirt, the lanyard around his neck reading Queensland Police was the only clue that he is a cop. He also got his 15-year service badge yesterday. Talking fondly about his job, Snr Const O'Brien said he had worked in child protection for the past seven months. "I just love my job,” Snr Const O'Brien said. 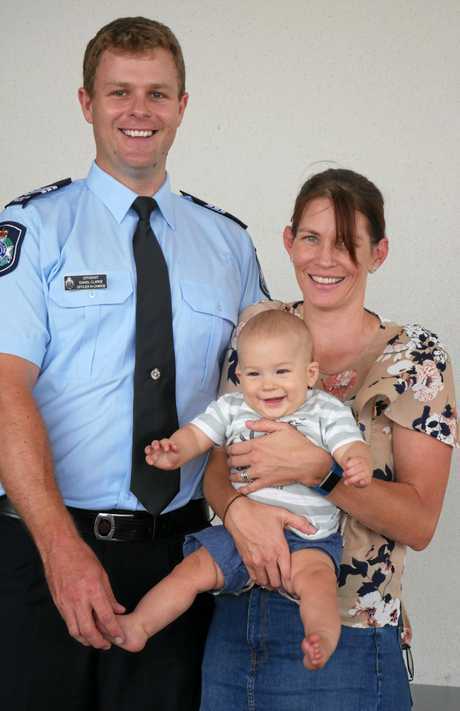 DAN Clarke is what the future of Queensland Police Service looks like. The sergeant works at a two-person station in Mundubbera, about a two-hour drive to the west of Maryborough. His wife Naomi and six-month-old son Henry proudly watched on as he received his 10-year medal yesterday. From attending crashes to helping members of the community, his days are jam-packed with variety. He recalls being first on scene at a homicide which happened in Mundubbera in 2016, during which he worked hard to preserve evidence. A proud Mrs Clarke said she trusted Sgt Clarke's skills and knowledge would keep him safe on the job in the years to come.